Home/Success Stories/From homelessness to success! Meet Lilly Harris! Lilly enrolled in our Supported Housing Program (SHP) while she was homeless. This program along with our Individually Developed Employment Assistance (IDEA) program provide individual employment services for individuals with psychiatric disabilities, have a history of substance abuse and those who are homeless. These programs take place at our New Haven, CT Campus at 830 Grand Avenue. Lilly’s employment specialist helped her find the resources she needed to obtain housing, ending her homelessness. Her employment specialist also encouraged Lilly to enroll in the G.E.D. adult education program which she is currently attending. 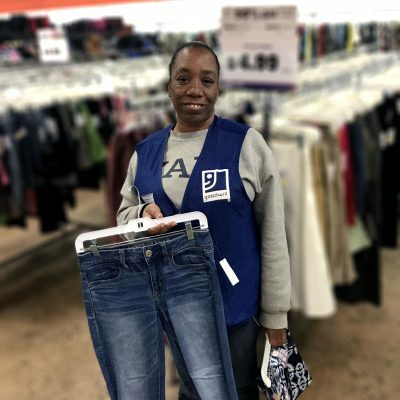 Lilly has been working in one of our Goodwill stores and has quickly become an exemplary employee. She has amazing customer service skills and is loved by coworkers and customers alike! Please join us in congratulating Lilly and her Goodwill employment specialists on her success. These successes wouldn’t possible without your contribution. Donating or shopping at Goodwill helps to fund our programs like SHP and IDEA, which enable individuals like Lilly to start on a better path in life. At Goodwill we believe in the power of work. ← The Winter 2018/2019 Creating Opportunities Newsletter is here!